These stylish Knox gloves are about to enter their second winter. 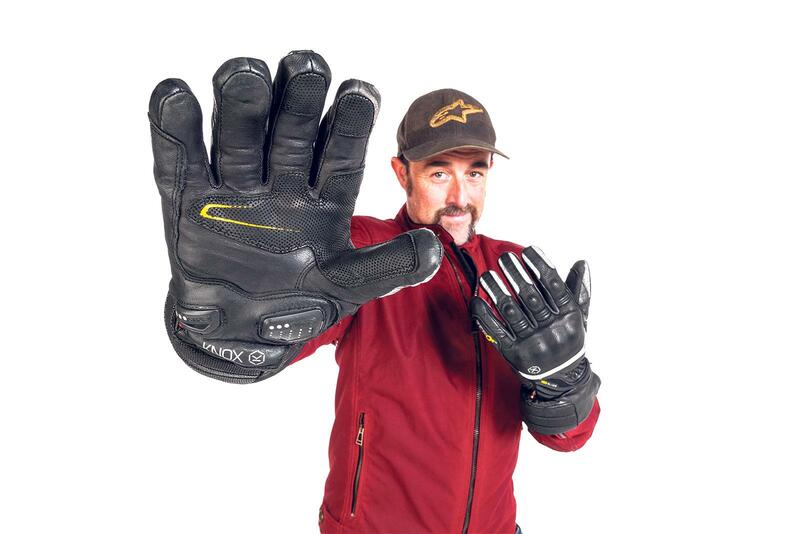 Unlike many winter gloves, the level of protection is high, with Knox’s patented low-profile Scaphoid Protection System (SPS) on the palm. SPS eliminates the grab effect that occurs when a leather palm makes contact with the road – reducing the risk of hyperextension, which can be the cause of a broken scaphoid. I’ve broken my scaphoid several times and I’m looking for as much protection as possible. There’s also substantial knuckle and finger protection. There are reflective panels on each digit, plus reflective piping used throughout. The visor wipe on the left thumb is a nice feature, as is the touchscreen-friendly material on the index finger. Most winter gloves are simply warm but only offer the same protection as a pair of oven gloves, these Knox Zero2s offer similar levels of protection to race gloves, in addition to being warm. The gloves felt stiff to begin with and it took around two months for them to bed-in and feel comfortable. They’re not as warm as two finger style winter gloves and after two or three hours of very heavy rain, some water does start to seep in. However, for a sporty winter glove they are impressive.